Everyone is familiar with the grape vine. The following information pertains to the dark grape species. 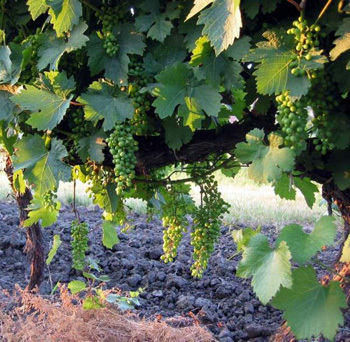 Grapevines supported on old-fashioned arbors and grown with special pruning methods produce more fruit than those grown on conventional wire training trellises. The top-area is exposed to more sunlight and the pruning secret is to take out some of the hard stems, and to pick off from a third to a half of the small bunches of grapes before they use up too much of the available plant food. Experts have found that more foliage means bigger, better-flavored grapes. Another variety: the fox grape (Vitis labrusca) is a high-climbing liana vine. Leaves rounded in outline, heart-shaped at base; 3-lobed, toothed, with dense whitish to reddish felt beneath. Fruits about 20 purple-black (or amber white) grapes in a cluster around September to October. Found in thickets, woods; southern Maine to Georgia; Tennessee to Michigan. Widely cultivated. In the reference book, 50 Years Anthology; The Herbalist Almanac, written by Clarence Meyer, edited by David C. Meyer, in memory of Joseph E. Meyer, “the Herb Doctor”, there is a small paragraph that seems apt here. This quote is reported to have come from the 1585 edition of Dodoens’ A Nievve Herball or Historie of Plantes. Treats blood and energy deficiency, night sweats, thirst, palpitations, rheumatic pains, difficult urination, edema, dry cough. Wild or cultivated whole grape leaves were put in the bottom of crocks to preserve the color of beans that were stored. Grape leaves also used to wrap fresh-made butter. Said to help preserve butter. Cultivated grape leaves considered best. 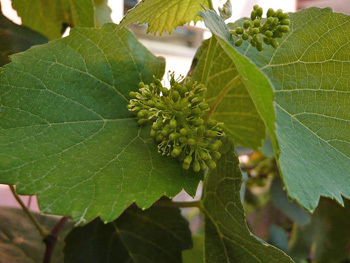 Vitis labrusca (fox grape) was used by the Native Americans as leaf tea for diarrhea, hepatitis, stomachaches, thrush. Externally, they poulticed wilted leaves for sore breasts, rheumatism, headaches, fevers. Other Vitis species have been used similarly. Vines, when cut in the summer, yield potable water, possibly purer than today’s acid-rain water. Drink the fresh juice of the fruit. According to one reference if grape juice is taken four times each day; 1 oz. in plain water and 3 oz. grape juice, taken 1/2 hour before each meal and upon retiring, then the matter of dieting will take care of itself. The only restrictions as far as diet is concerned, should be sweets, chocolate; great quantities of sugars, pastries. But all other foods, vegetables, and meats, provided they are not fats, may be taken according to the appetite; but the appetite will change a great deal. Obesity will regulate itself when this is done regularly. Do not confuse the fox grape vine with Canada Moonseed (Menispermum canadense), which is considered toxic. LiveStrong.com: What Are the Benefits of Red Wine Extract? MayoClinic.com: Red wine and Resveratrol: Good for Your Heart?